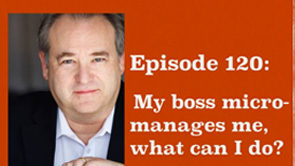 Episode 121: Managing your ‘ego’ in the workplace. If you are a regular of The 3 Minute Mentor my guess is you have some determination and drive. To achieve what you want to achieve you have to exhibit confidence and to lead people. Both of these are good and should be encouraged in yourself and others. The problem starts when this becomes unchecked and it can look to some that you think it’s “all about me.” When this happens confidence can look like ego and could derail a career. The Economic Times recently look at 5 things you can do help – we explore these five things in this episode. This entry was posted in Management, Personal Effectiveness on July 6, 2015 by Nigel Dessau. My boss micro-manages me, what can I do? micro-managed? Here are some ideas. This entry was posted in Management, Personal Effectiveness on June 5, 2015 by Nigel Dessau. Here are three things to think about when managing a new approach in an old, established company. This entry was posted in General Business & Marketing, Management on January 10, 2014 by Nigel Dessau. What is an Agile development method? “Agile” is as much a mind set as it is a methodology. Your organization has to both be willing and able to adapt if it is going to adopt this approach. This entry was posted in Career Planning, General Business & Marketing, Management, Personal Effectiveness on November 19, 2013 by Nigel Dessau.